The bore size of the 450w is an even match for its closest competitor, the Siemens Espree. While ten centimeters (just shy of 4 inches for you Imperial system users) might not seem like a lot of extra space to the average person, it can make a very big difference in the comfort of larger patients or patients who suffer from claustrophobia. A frequent criticism levied against wide-bore magnets is that their image quality begins to decline around the periphery of the image. The 450w answers this concern with a 50-centimeter FOV, paving the way for its use in a wide range of diagnostic exams. 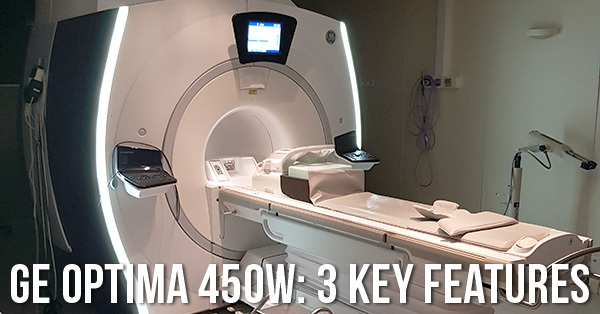 For providers who plan to perform specialized studies outside the bread-and-butter scanning of a typical patient load, the 450w’s gradient class makes it a good pick for cardiac and diffusion imaging. With a gradient slew rate, or “rise time”, of 150, the 450w yields thinner anatomical slices and higher image clarity than many of its contemporaries. If wide-bore comfort that doesn’t sacrifice image quality is the criteria, the Optima 450w should be a notable contender on any equipment buyer’s short list. If you would like to have more information about the 450w or other MRI models, our team is ready to assist. Use the button below to tell us about your project and how we can help make it happen.